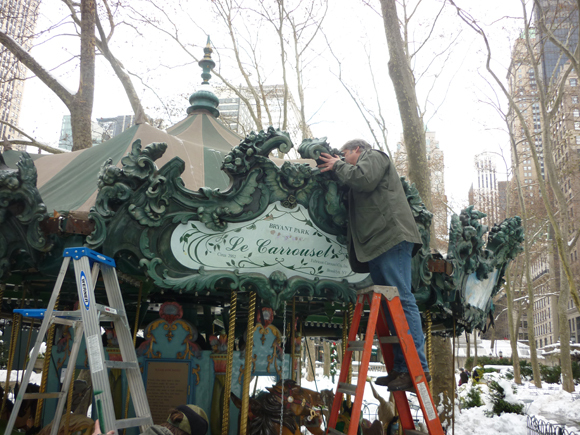 Considering the popularity of Le Carrousel at Bryant Park, keeping it in tip-top shape is a priority for the Bryant Park Corporation. Our little jewel will be open every day through the holidays, and we expect another busy season, but that won’t stop us from performing regular maintenance on the carousel and the ticket booth. This month, we’ll clean the carousel’s top, replace the counter inside the ticket booth, and refresh the gravel surrounding the amenity. Later this fall, we’ll also re-stain the deck, rewire the rounding boards, polish the brass poles, replace the carousel’s fiberglass finial, paint the ticket booth both inside and out, and repaint the entrance and exit signs. We’ll do all of this with minimum disruption of service. Le Carrousel is open every day through October 26 from 11:00am-8:00pm. Rides are still only $2, and a Frequent User card gets you 10 rides for $15. Beginning on October 27 (the day Citi Pond, The Holiday Shops, and Celsius open for the season) and continuing through January, the operating hours are 11:00am-9:00pm, Sunday-Thursday; and 11:00am-10:00pm Friday-Sunday. Look also for special hours at Thanksgiving, Christmas, and New Year’s. And remember that the Halloween Party at Le Carrousel is on Saturday, October 29, 1:00-2:00pm.